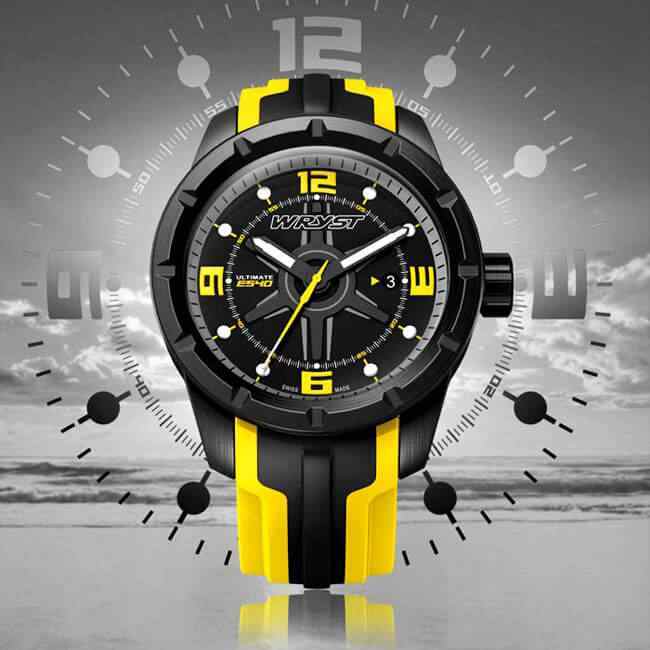 Black DLC Swiss watch Wryst Ultimate ES40 with yellow details on the dial. 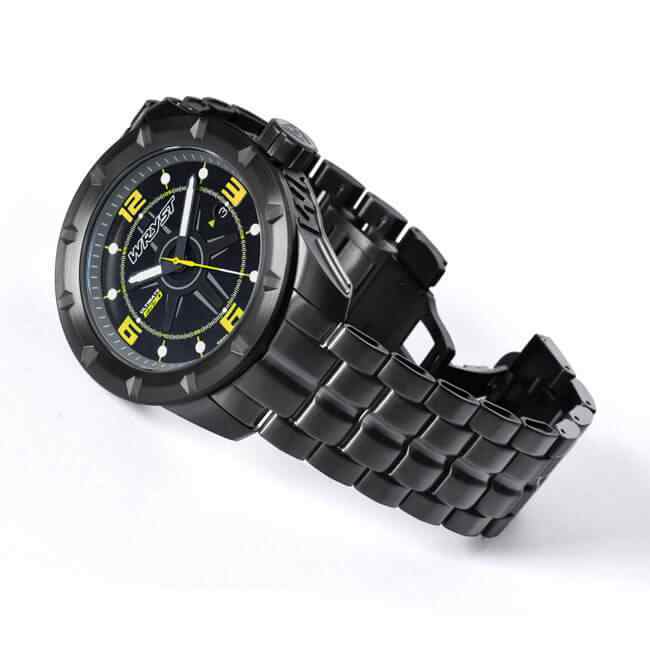 Men who prefer a more bold and chunky feel will be delighted with this size 45mm metal sport watch. 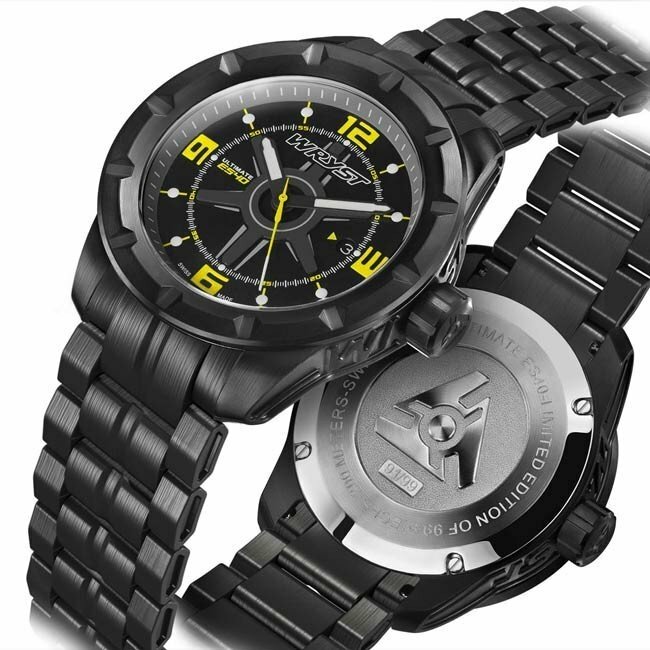 The tough stainless steel watch with black DLC coating weight in total 206 grams. Choose today to purchase a Scratch-Resistant black Swiss watch with sapphire crystal at an affordable price. This Wryst ES40 also benefits of 200 meters water resistance with a secured screw in signed crown. 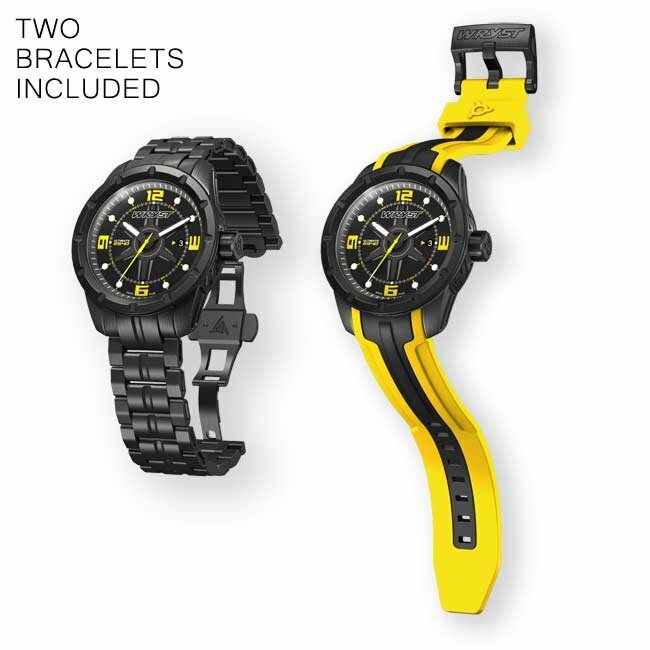 Receive also with this timepiece a double injection black and yellow silicone strap! 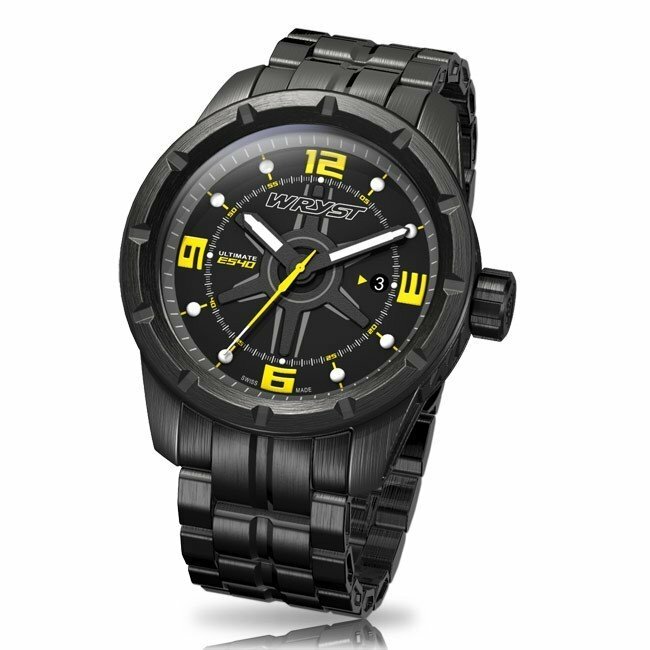 Make an impression with the strong and resistant black Swiss watch Wryst ES40. This reference in solid stainless steel case and bracelet is coated with a strong and hard black DLC technology. The Swiss timepiece will deliver with a reliable and durable Ronda 3 hands, date movement. 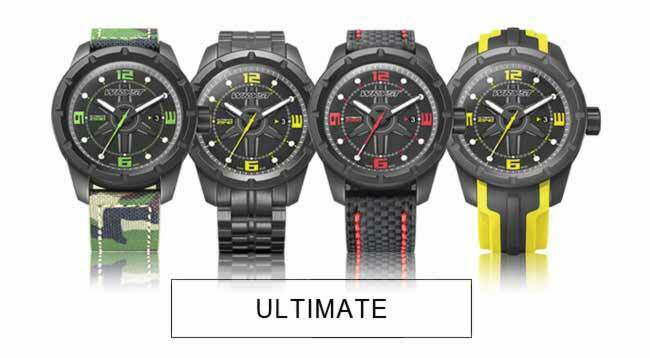 If you are also looking for uniqueness and exclusivity only 99 of these sport watches in black and yellow will ever be on the market. Therefore we would recommend you hurry and purchase one of these without delay. Are you looking for a particular serial number? Your year of birth? Looking to gift one of these black DLC Swiss watch? Contact our customer service. 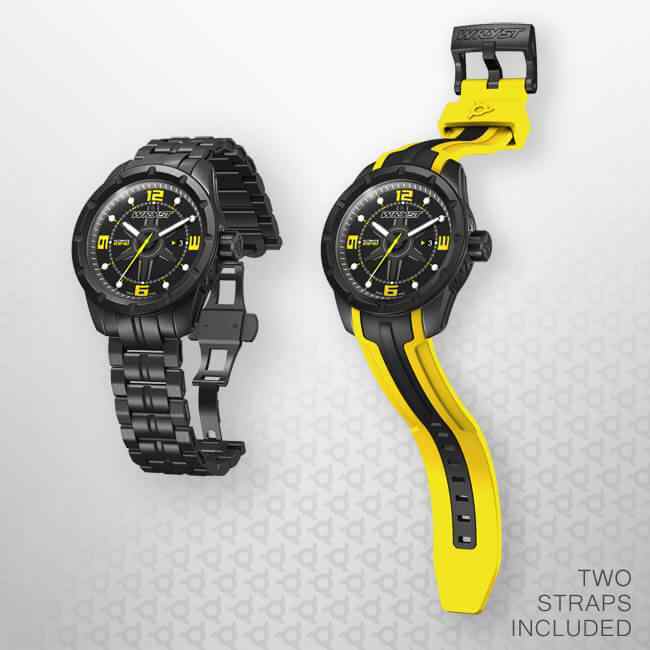 The black DLC Swiss watch ES40 will also be delivered with an extra yellow silicone bracelet with a black line for a more sporty look! Designed to endure the tough natural environment the ES40 is a versatile companion that will adapt to your activities. Just add a message during your purchase if you require we fit this silicone band instead on your watch for delivery. 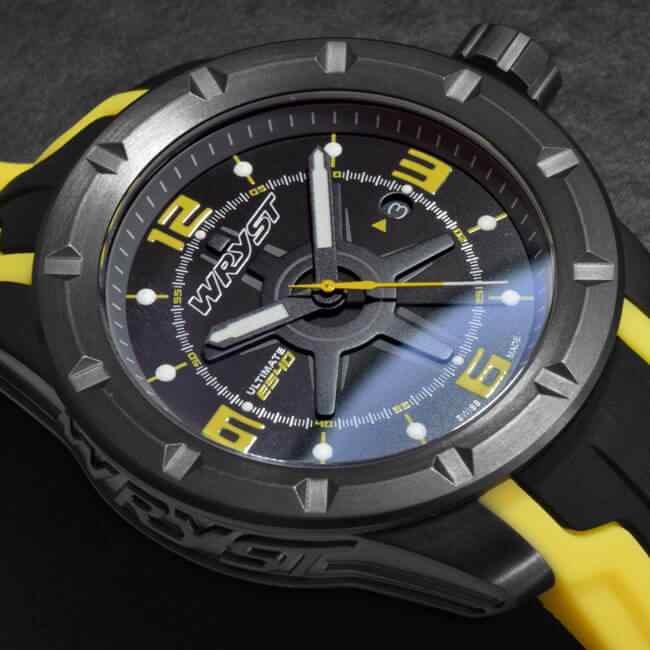 Since 2012 Wryst produce small quantities of quality and durable sport watches. 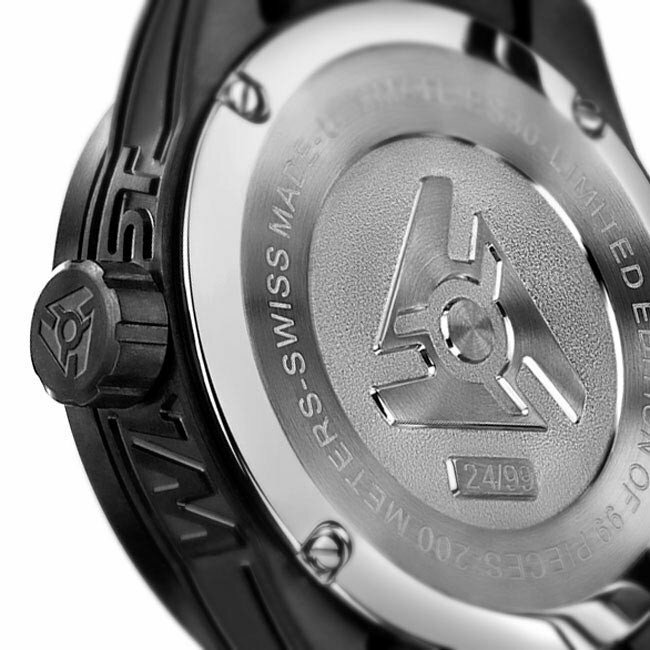 Manufactured and assembled with the Swiss know-how and craftsmanship precision, your investment is in safe hands. The Swiss brand Wryst provides a faultless after sale customer service worldwide.